Colonel Dayrell R. Oakley-Hill (1898-1985) was among the British officers who were assigned the task of organizing the Albanian police force (Gendarmerie) in the 1930s under the direction of General Sir Jocelyn Percy (1871-1952). 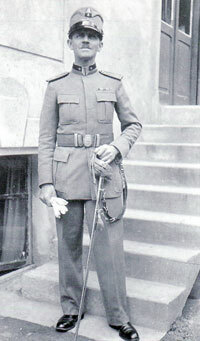 Oakley-Hill was born in South Africa, completed his military training at Sandhurst, and served with the Indian Army in Mesopotamia from November 1917 until after the end of World War I. He was recruited for the Albanian mission in 1929 and served principally in Elbasan, where he learned Albanian and travelled extensively. He was forced to leave Albania with the withdrawal of all the British officers in November 1938. During the early years of World War II, he worked for the Special Operations Executive in Belgrade and Kosova as a specialist for Albanian affairs to help organize the resistance. He was obliged to surrender to the Germans in Belgrade in 1941 and was held as a prisoner of war until October 1943. At the end of World War II, he headed the mission of the United Nations Relief and Rehabilitation Administration (UNRRA) to Albania to provide humanitarian assistance there until work became impossible and he resigned in 1946. From January 1951 to 1955, he was posted to the British Embassy in Athens and worked for M16. In later years, he served as chairman of the Anglo-Albanian Association in London. His memoirs have been published by The Centre for Albanian Studies in the volume “An Englishman in Albania: Memoirs of a British Officer, 1929-1955,” from which this extract is taken. General Percy had a weekly meeting with the King to discuss past, present and future affairs of the Gendarmerie. When my Albanian was good enough he began to take me along to interpret. The reason for this was of course no reflexion on his Albanian interpreter. It was simply that he knew by instinct that Zog would open up more freely to him if no Albanian were present, and it seems that he was proved correct. The King accepted me and fortunately spoke a clear and understandable Albanian. He was always ready to give his own views on any matter and on any personality. Zog sat at a large desk on the far side of a very large hall, with practically no other furniture except vast oriental carpets. We were ushered in by his chef de protocol or one of his officers, such as Colonel Hysen Selmani, the commandant of the Royal Guard. The King would always get up and come round his table to shake hands and then we would sit in upright chairs at his desk. The first time was certainly nerve-racking. But I can remember only one occasion later on when, from pre-occupation or an attack of nerves, I lost the thread of a whole sentence - Zog was apt to say rather a lot at a time - and I had to ask him to repeat it all again. He did so, kindly and without a word of reproach. Zog was fond of telling stories, either about his past or snippets of history. He had a good sense of humour and always seemed calm and unflappable. He gave me the impression of being a confirmed optimist, a quality he needed to see him through that most complicated job he had undertaken: to be king of the new Albania, with its heritage of independent chiefs, its crosscurrents of local politics and its economic dependence on outside support. Perhaps it was because Zog played his cards so well that Mussolini finally lost patience and used the big fist. Zog was tall and slim and held himself well. He had strong, clean features, with a slightly pointed moustache, and thoughtful and penetrating eyes. He did not look at all like a textbook highland chieftain, though the Zogollis were one of Mat’s leading families. Born in 1895, Ahmet Zogu was the son of Xhemal pasha Zogu and Sadiye, a member of the Toptani family. He went to school in Turkey, where he also attended a military school, but returned to Albania just before the Balkan Wars of 1912. Though only 17 he at once took an active part in politics and joined the group of patriots under Ismail Qemal Vlora, who declared Albania’s independence at Vlora on November 28th, 1912. He was active for the next few years in a military sense. He assumed control of Mat and led his men against Serb, Montenegrin and Bulgarian invaders, and defended his own territory against internal factions and intriguing elements. He supported Prince Wilhelm of Wied who had been appointed by the Powers as Albania’s king in 1913, but who was only able to remain for a few months of 1914 and was confined to Durrës where he had landed. Esad pasha Toptani, Ahmet’s uncle, was a man of ambition and had raised forces to oppose Wied, and he looked somewhat jealously on his popular nephew. Ahmet had to retire for a time to Mat. When the Austrians invaded the country they too became rather suspicious of Ahmet’s qualities, and interned him in Vienna. After the war, he returned, with difficulty, and in 1920 was a leading spirit in calling the National Congress of Lushnja, which reaffirmed the country’s independence. Even his Republican opponents admit that young Ahmet Zogu did well at the Congress, and also deserved credit for arriving there at all. With 200 of his Mat men he cut his way past Italian troops holding the Tirana-Durrës area. This Lushnja Congress was historically most important; it was a warning to the lingering Italians to get out, and a warning was in fact sent to the Italian troops holding Vlora. The Italians hoped, as the result of the Tittoni-Venizelos pact, that they and the Greeks would divide Albania between them. The Albanians had no intention of losing their independence, and actually attacked the Italian troops at Vlora. The Italians left and later signed an agreement with the new Albanian Government: they did, however, retain the Island of Sazan (Saseno). In the new government, formed after the Congress, Zog became Minister of the Interior. After stormy years during which he met opposition from some circles who thought he was not progressive enough and was working for the benefit of the boys, he had to leave the country for Yugoslavia in 1924. But, with some Yugoslav help, he returned and entered Tirana, after some fighting, on December 24th, 1924. This date is called by his supporters the Day of Legality (Legalitet), and since he was driven out by the Fascists in 1939, his supporters, wherever they live, have belonged to the Legality party. Zog was declared President of the Albanian Republic, under a new constitution, on January 31st, 1925, and in the following year signed instruments of alliance with Italy. He was proclaimed King of the Albanians on September 1st, 1928. In structure the monarchy was constitutional. There was an elected parliament of one house, and a council of ministers responsible to it, though in practice much more responsible to the King. Members were elected indirectly, that is by electoral ‘colleges’, or representatives in each constituency. In the country districts both the candidates themselves and their electors were usually the more important local figures, but in towns lawyers, journalists and so on, could be, and in fact were, candidates and became deputies (Members of Parliament). 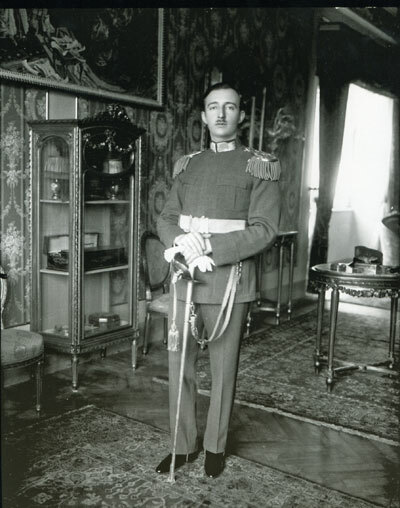 It was generally felt that all candidates were approved by King Zog. When Parliament was not sitting - and that was for considerable periods each year - decree-laws were issued under the King’s authority. These covered most special measures, Parliament’s laws being mainly concerned with the routine business of the country. Ministers ruled their departments autocratically. They would of course put proposals to the King and he would certainly discuss them, but whether they were accepted or not, the King’s view was generally understood to be the deciding factor. Occasionally we had some reason to call on a minister, especially the Minister of the Interior, but it might be the Minister of Finance, or Education, or Public Works, and if, as more often than not happened, they were unable to help in the matter concerned, it was easy for them to shelter behind their dependent position and say ‘The King doesn’t wish this’, or ‘The King wouldn’t like that’. It was fortunate, in many cases, that Percy had direct access to the King, and he did not hesitate to use this approach when necessary. Many people criticised the King for surrounding himself with what they considered a bunch of corrupt ministers. I am sure not all were corrupt, but equally certainly some were if one could believe a fraction of the things one heard about their ways. I do not think any ministers made fortunes and quite possibly none tried to; there was not much money in the whole state budget, anyhow. At the same time Parliament voted, say, a sum for the repair of a road, and the road was never repaired, and people wondered where the money went. The sort of corruption that constantly occurred was political, and this was of the kind by no means confined to Albania. Ministers liked having power and using it. If someone wanted a job in a government office, or a place for his son in one of the few good schools, he would go to see the minister concerned. Ministers were remarkably approachable by individuals, and by granting a request they made a friend and supporter, so they could say yes to those whose support they thought might be of value, and no to the others. Once you did a service to a minister and were in his good books you could get anything within reason. Nepotism was rife; if you had a friend who was a cousin of a minister (and had not quarrelled with him), your friend’s word was your passport to success. In the same way, a minister could grant the request of a local chief or landowner, or perhaps of a prefect, to take some special action in his area, and he would then gain local support. Cabinet succeeded cabinet, but the changes were few. If the Prime Minister wasn’t Pandeli Evangjeli, he was Koço (Kostaq) Kotta; they more or less took it in turns. Musa Juka remained at the Interior for much of the time. One man brought in as Minister of Education made a good impression; this was Hil Mosi, from Shkodër, who seemed a sincere and earnest man who tried to get things done. The King made one sudden departure from the usual custom. This was in 1935-36, when he was in the middle of a quarrel with the Italians and no doubt wished to emphasise his independence. The change was probably also inspired by the revolt at Fier, which is mentioned below. The King brought in a government of young and new men, under Mehdi Frashëri. Frashëri was a tried minister, honest, intelligent, and sensible. The P.M. had to be a man of experience, and Frashëri was the only one the new men would agree to serve under. The public grew quite excited and thought a new era had arrived. I knew most of the ministers, and it was pleasant to go round and visit them. Several were known to be anti-Italian, and some had an Austrian background, which was a lot safer. One felt instinctively that they wanted to get rid of the old ways and really change things for the better. That was a happy year, but it was only a year. Suddenly it was autumn again and the leaves turned brown, the odd lot were back. The King was no fool, and I can only conclude that Frashëri, appreciating the anti-Italian slant of the young cabinet, put too much pressure on him - and not for the first or last time. The answer to the question as to why Zog normally retained the old group of people as ministers is probably that he was tied by internal politics. Before his arrival at the top, Albania had had no government of its own for 450 years. Even when the great Skanderbeg of the 15th century achieved a temporary unity because of his own personality and his tremendous struggle against the Turkish invaders, which won for him the support of the whole people. Before him the country had lived through restless centuries of clan rule even when it was not being harassed by Bulgars, Serbs, Venetians, Normans and Romans. Whatever the rule of Queen Teuta and other early figures was like, it would not have been democratic. 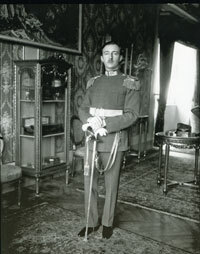 King Zog in 1928 (Photo: Marubbi). Zog faced a new situation. There had been no peace from 1912 to 1920, and when the Provisional Government began its task, not only was Albania surrounded by three hostile and hankering neighbours, but there was no cohesion inside the country. The Albanian’s independence began at home with himself, his family, his clan, his bajraktar, his bey. All had their own ideas, their own ambitions. Could an ordinary modern democracy, with its clanking machinery, suddenly set up in Tirana, have succeeded in controlling or unifying the country. Impossible. The motives of Bishop Fan Noli and other republicans, whether in politics or outside, who opposed Zog, may have been entirely sincere, but they were in too much of a hurry. Noli would never have coped with the innumerable factions and tensions. The personal touch was needed. Zog had built up a personal, military and political prestige, and there was nobody else who could take his place. He knew what sort of men the local leaders were, and learned how to handle them. Possibly by money presents, certainly by underwriting their local prestige, he kept them sweet and gradually won their support and, remarkably, retained it in general for nearly 15 years. The presence of British officers in his Gendarmerie showed the people that the King was not entirely in the hands of the Italians. The gradual improvement in the force itself was a guarantee of law and order, which was as good for the local leaders as it was for the rest of the country. Moreover, it restrained those, such as Gjon Markagjoni, the Kapidan of Mirdita, who might have excessive ambitions of their own, from resorting to any turbulent action. There were only three revolts during Zog’s fifteen years. The first was in the northwestern highlands, where the Catholic Dukagjinis and some neighbours took up arms late in 1926. The motives of their revolt have never been satisfactorily explained. Certainly these people had grievances; nothing seemed to be done to improve their poor conditions of life in those hard mountains; but they were not the only ones with such conditions. They were also said to resent having a Muslim President. But somebody must have pushed them into taking up arms at that moment. It was popularly said that unofficial Jugoslav agents had urged them on, with the object of preventing the King from going ahead with his pact with Italy. Yet these people were Catholic, they feared and hated their traditional Slav enemies, especially their neighbours of Crnagora, and they were more likely to follow an Italian lead, which was precisely what they did in 1941, as I shall tell later. Also it was said that some Albanian officers had come north to encourage them. If true, these may have been just disaffected individuals, but the Army was trained by Italian officers. The Fascists may indeed have wished to frighten Zog into signing what they wanted, and rumours are easily spread. The weight of the evidence is against the Fascists. Be that as it may, General Percy, then a new arrival, was sent by the King to Shkodër where he took command of the operations against the rebels, who were duly crushed. In 1935, a small revolt broke out at Fier. Some troops and civilians rose in the town, and unhappily shot dead in the town square Zog’s friend General Ghilardi (of whom more later), who had just arrived on an entirely innocent journey. The rebels pushed north towards Lushnja, but the C.G. of the Gendarmerie, Colonel Shefki Shatku, took lightning measures and a force from Lushnja put paid to this revolt. 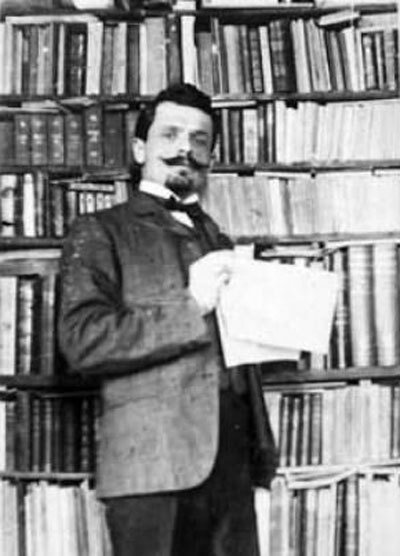 Two Gendarmerie officers, a major and a lieutenant, appeared to be involved, and also an English-speaking journalist, Konstantin Çekrezi (Chekrezi), who was a firm opponent of Zog. The third revolt occurred in 1937. It was a quite extraordinary personal adventure rather than a revolt. Ethem Toto was a Captain in the Gendarmerie who had been picked by the King as a Prefect because of his ability. Prefects were governmental, and ultimately royal, appointments, and represented the government in their Prefectures, of which there were ten. After a spell as Prefect, Toto was Minister of the Interior in Mehdi Frashëri’s 1935-36 cabinet. On the fall of this government he was sent to Delvina in the south to ‘rest’. Musa Juka, back in his chair at the Ministry of the Interior, was said to have “persecuted” him there and it seems he could stand no more threats and mishandling. Ethem Toto suddenly rose, with a group of armed friends, seized a number of lorries at Delvina and took them to Gjirokastër. Arriving there in the early hours occupied the Prefecture building and telephoned the Qark commander, who was asleep at home, that he was under arrest. The latter whose telephone was then disconnected, rushed round to the fortress and collected a few gendarmes, only to find that the fortress was already partly under rebel control. Ali Pasha’s great fort dominates the town from a spur of the long, bare mountain on the lower slopes of which this old town straggles, and it served as the Qark headquarters and also as an important prison. The gendarmes tried to fight the rebels in dark passages and around corners, but had to withdraw before superior numbers. Toto released all the prisoners from the fort, piled them into his lorries, issuing them with such weapons as he had, and took his convoy past Tepelena and along the hilly, winding road towards Vlora, where he thought he had support. News, however, had been sent out of Gjirokastër by telephone, and the Gendarmerie of Vlora, followed by other detachments, were sent with commendable speed in lorries to meet the rebels. They climbed the hills outside Vlora in time to deploy off the road, and as the rebel lorries came in sight they shot the tyres and stopped the convoy. Toto and his men spread out on the hillside but were outfought and escaped over the mountain to the wild Kurvelesh area. Gendarmerie forces eventually closed in on him and he met his end, near the hill village of Golem, by his own hand. His brother, Ismet, a younger man whom many of us had known and who moved in intellectual circles, had supported Ethem, and was captured and later executed. It was a very tragic event, and a quite amazing one. Most people assumed that Ethem Toto had simply had a mental breakdown. I had the job of investigating the whole incident with the Gjirokastër Qark Commander, Captain Ded Jakova. These last two movements could be ascribed to the frustrated outbursts of intellectual progressivists, and as such revealed the existence of some smouldering fire which produced the wisps of smoke. But these were all, and the Army and Frontier Force, as well as the Gendarmerie, remained loyal during the whole of Zog’s rule. Perhaps because of my position, though I had many friends who were not afraid to speak frankly, I heard very few expressions of disloyalty to the King, apart from the usual grumbles about some of his ministers, for whose behaviour he was partly blamed. There was one extraordinary character whom everybody feared and hated. This was Abdurrahman Krosi (or Mati, after his place of origin, Mat), who was a confidant of the King but had no specific job. How he came to hold his unique position nobody really knew, and people invented outrageous stories about him, such as the one that made him Zog’s father - a fantastic slander if ever there was one (Zog’s mother being an honourable lady of a most honourable family). Krosi collected a little clique of hangers-on and was supposed to have his finger in almost every pie; his hold over some Ministers was remarkable. If some promised reform or eagerly-awaited move went wrong, Krosi was blamed. It was also argued that Zog kept him as a useful scapegoat, who could take the blame for everything, but had no responsibility. This seems unlikely, as Zog’s shoulders were broad enough and he had plenty of courage. Another colourful character in the King’s entourage was General Ghilardi. Of Croat origin, he had apparently found his way to Albania at the time of Prince Wilhelm of Wied’s abortive kingship in 1914. He supported Wied, as did the young Ahmet Zogu, and these two became friends. Ghilardi wore the uniform and rank of a general of the Army. His job, however, was that of nominal head of the rather unimportant para-military militia, and he was mainly an odd job man, and a close companion of Zog. He was a huge bearded figure with mighty shoulders, and his body tapered markedly down past his high boots to his rather small feet. He was never seen in any other dress, but he might be observed at the window of his house, his jacket hung on the window and his great torso bare, rubbing himself with olive oil. He had very little to say, and the only notable remark of his that I recall was at a dance at the Town Hall. He stood next to me watching the dancers, among whom was a lithe, slim Albanian girl dancing energetically with a diplomat. After watching her for a time, he turned to me and said in his big gruff voice, ‘Elle est comme un serpent!’ When he was shot at Fier, I felt that much of the colourful and symbolic pageantry had been lost to all public functions. He was given a military state funeral, and his bier on a gun carriage was conducted, with the Army Band, all the way up to the huge Vorr’i Bamit cemetery. I was one of the six who walked beside the gun carriage. Someone had forgotten that the road was bumpy; the cushion holding his medals was not properly secured and fell off and one of us had to carry it. Worse still, the bier rocked violently and we were afraid that the much lamented Ghilardi would at any moment be discharged with ignominy on to the roadside. We held on to the bier and the worst did not happen. Even the firing party did no damage. Vorrin tem mos e harroni. Nesër bajnë tjerë për ju. A very interesting personality at Tirana was Midhat bey Frashëri. A member of the great Frashëri family of poets and patriots from Frashër in southern Albania, he was an intellectual and a great gentleman. Not a supporter of Zog, he was allowed to live unmolested in the capital because he wisely kept out of all politics. I met him soon after I began to live at Tirana, and he asked me to his house and gave me afternoon tea (the fashionable thing then in Albania). I kept this visit quiet, just in case ... but I often visited him at his shop in the Rruga Mbretnore (Royal Street). He kept a stationery shop, including school books, and school children seemed to be his best customers, though no doubt anyone needing paper or a pencil would drop in there, just as I did. He sometimes gave away rubbers and pencils to small children. Midhat was of a modest and gentle demeanour and had great personal charm. He kept very much to himself, spending his evenings in his library at home. He was both reader and writer and had a wide knowledge of literature. He was one of those rare people whose genuineness “stuck out a mile.” Rosamond and I both liked him immensely. He had an occasional stutter which almost added to the charm of his voice; he spoke so quickly that it sometimes seemed that he was falling over himself. I was extremely surprised many years later to meet him at Bari, at the time of the UNRRA mission, 1945 or 1946. Like thousands of other good men, he had left Albania when the Communists moved into power in 1944 as nothing but death awaited him in his own country. He was the much loved and respected leader of the Republican movement, the Balli Kombëtar, or National Front, which had been active in the Resistance and has continued to flourish in exile, like its rival the Legalitet, or, to give it its full title, O.K.L.L. - Organizata Kombëtare e Lëvizjes së Legalitetit, the National Organisation of the Legality Movement. Midhat Frashëri was living with many others in a refugee camp near Bari, and he called on me one day at an office in Bari, when I was chief of the UNRRA mission to Albania, and gave me a long written essay on the history of the Resistance movement, pointing out the British error in supporting the Communist Partisans at the expense of his movement. There was a great deal to be said for his point of view, as there was about our similar error in not giving better support to the Monarchist resistance under the redoubtable Abas Kupi; but all this is another story. I sent Midhat’s papers to Harold Macmillan, who was the British government’s representative at the time with the Allied Military Headquarters in Italy. Midhat, like Kupi, became one of the members of the Free Albania Committee set up in Rome in 1949, and I met him in London in 1950 at a party given to them when they were on a visit in search of moral support. Most unhappily he died in America not long afterwards, a very great loss to the Albanian exile community. The people I met in Albania would fill a book and I would like to paint a hundred pictures of them. But I have been able only to select a few.